Golf putting is a feeling process. What are you feeling? Feel the touch of the putter on the ball. That touch must be solid to truly feel it. All of your efforts should be towards honing this feeling. Practice hitting the ball solid. The putter must stay down through the ball to keep it on line. If it goes off to the right, you may have moved your head. Keep your head still especially on short putts. Before you putt, how do you pick a target? I look at the part of the cup I want the ball to roll over going in the cup. Look only at that part of the cup you want the ball to roll over going in the cup. Once you see it clearly then look away to the ball. Now, focus on striking the ball solid and at the target. Remember the part of the cup you want the ball to roll over going in. Now imagine where the ball will have to come from to go in on that side or part of the cup. This is your line. This is the line you will be trying to putt your ball on, so choose it carefully. Once you have seen the line, find a spot in front of the ball that will aim you in that direction and line up on that spot. Next, think only of how hard - or better yet, the distance - you will have to stroke the ball. This is most important in golf putting. It determines how short or how far past you will roll the ball. This is why we practice! You don’t have to look back. Your mind can hold the target without another look. Trust me! This seems like a lot of things to do and to remember. But that’s what the routine is all about. Practice for feel and distance, as well as the routine. This is how to get it all right before you putt the ball. All putts should be attempted from the center of the putter . But on breaking putts (right-to-left and left-to-right), the zones of the putter come into play. If you strike the ball on the "heel" zone of the putter, on a downhill left-to-right putt, the physics of this stroke will create a putt that will start a little farther left than you might have intended. But, this will give you more chances of making the putt. Likewise if you strike the ball on the "toe" zone of the putter , on a downhill right-to-left putt, the physics of the stroke will create a putt that will start a little farther to the right than you might have intended. But, it will give you more of a chance to stay above the hole during the putt. This thought alone - keeping the ball above the hole - will give you more chances to make putts. Remember, in golf putting, touch and distance control are achieved by striking the ball in the center of the putter every time. This is how you get the ball to go the correct distance and in the intended direction. Putting distance control is achieved by an even swing. A swing of equal distance, back and forward. For example, in a three-foot putt you may move the putter back three inches and through by three inches. This stroke may cause the ball to roll some four feet. Your finish of a putt should leave you with your putter toward the cup, and your left wrist should be straight and not bent. What is a golf putting post? This is where you place your head while practicing putting. This position will keep your head still. Now, you must practice rocking your shoulders up and down. Any other movement of your body will take the putt off-line. Try it. Place two tees in the ground with the distance between them approximately the width of your putter, plus a little extra cushion to get your putter through without touching the tees. You have your gate. Now, putt through the gate. Practice this until you can think only of the putt and not the gate. Your only focus should be on making the putts. For perfect golf putting, your left eye (or your right eye for left-handed players) should be directly over the ball. To check this, take another ball and put it directly under the eye in question and drop it. If it hits the ball you are putting, then you are in the correct position. Now, turn your head only to look for the line. Walk to the middle of the putt to see the true distance. The true line is seen from behind the ball. For example, you cannot see the true length of a club by looking at it from the grip. Same thing with a putt. For short putts, grip down on the club. For long putts, grip the end of the club and stand tall while widening your stance. To target your putts, find a spot or mark that is one to two feet in front of the ball. The spot must be on the line to the target side of the hole. Remember this mark. This is what you will line up on to make your putt. 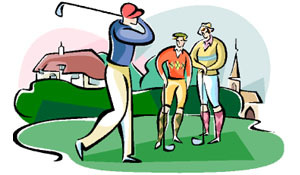 Now, practice this - one point at a time - until you get all the golf putting points together in a routine. Practice how you play and play like you practice.